I think it’s interesting to note that niqab is about being looked at but not being SEEN. But all the same, these ladies should get a little humility. Staring somebody down is just impolite! The niqaab in that second picture looks ridiculous. It’s so tight against her face and it’s see through. What’s the point in even wearing that! I’m sorry, I just feel a deep visceral reaction to covering a woman’s face–it’s like blanking out her identity, saying she’s a non-person. It isn’t Islamic, it comes from pre-Islamic patriarchal cultures where women were chattel with no rights, which contradicts Islam. Now Arabs have made it their own, and it looks like you’re getting used to seeing it around you all the time. But this here Amrikiyah still in Amrika just can’t get used to it, I’m not going to get used to it, I feel it’s so very wrong to impose this on women. I have no problem with hijab as long as they don’t negate our faces. We are people too. All fun with looking, gazing, flirting, staring, aside. OK, I get that it’s a hoot to subvert the overt signifiers to make them ironically the opposite of their ostensible meanings. But I feel the niqab is just the wrong signifier to start with. I’m happier as an overtly uppity Amrikiyah enjoying my freedom and equality over here, plain and simple. I think you had the right idea with keeping your gaze down, which is the real hijab, not a piece of cloth which is more of a fashion statement. And frankly keeping-the-eyes-down is practiced MORE by unveiled infidel Western women in their miniskirts here than by niqabi sisters in the Middle East flirting all over the damn place with their eyes. It’s a plain matter of practical safety on the street for women not to meet strange men’s eyes–we all learn this from experience quickly enough, and don’t need a holy book or bearded preachers to be reminded of it. Assalaamu alaikum wa rahmatullahi wa barakatuhu. 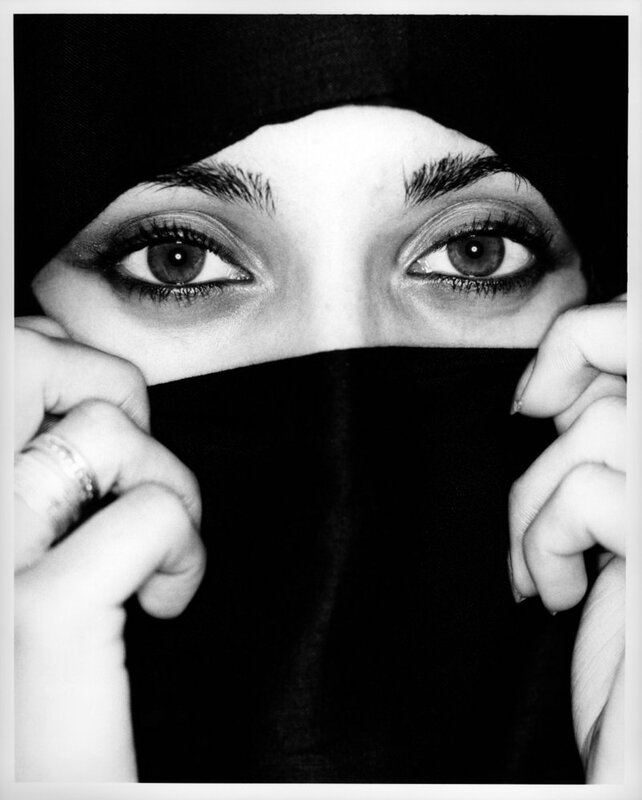 The wearing of niqab is Islamic and mustahhab. The wives of Prophet Muhammad (sas) wore it. By the way, I am an African-American niqabi from South Central LA (now overseas). I have identity, a voice, courage, worth, strength, self-respect, dignity, purity, humility, sensibility and chastity. Alhamdulillah. Salaam! Im polish student – 22 y o girl. I have many muslim friends and I believe in Allah. Im not like other european girls. I dont want to feel like a thing for men. I would be proud to wear niqab. I think its fantastic solution. But here, being a muslim is not safe. My family wouldnt accept it. And if i would wear niqab here, i would be killed in few days. 😦 Here, if I wanna hide my sexuality, i can just wear long cardigans, big trousers etc…and it doesnt look good. I would like to wear hijab or niqab 😦 Big hugs for you, sadiki. strength to you Umm Isa. I agree with what you said. as well as with waht shukriya and Asia said, very good points masha ALLAH. I don’t agree with everything you say but writing and addressing issues that people want to keep underwraps is very refreshing and a great eye-opener. im 14 yaers old and i live in the u.s. i have just recently started to wear my hijab and people make fun of me and call me a terrorist somtimes i cry but i dont kno what to do????? KEEP TOTAL FAITH IN ALLAH AND ISLAM, FIND YOUR OWN STYLE WITH HIJAB OWN IT AND INCORPORATE IT INTO YOU BEING AND PERSONALITY,AND SOON WHEN YOU BECOME COMFORTABLE IN YOUR OWN, YOU WILL BE AND INSPIRATION TO OTHERS INSH’ALLAH, AND YOU WILL BE PERFORMING WHAT IS CALLED DAWAH,IF I’M NOT MISTAKEN,I AM A NEW CONVERT MYSELF,WHICH IS THE PROPAGATION OF THE RELIGION OF PEACE…ISLAM. ALLAHU AKBAR. I LIKE ALL THAT I HAVE READ HERE AND I AM GLAD I CAME ACROSS THIS SITE. I DON’T KNOW IF THIS MATTERS BUT I AM OF AFRICAN DECENT AND A MIXTURE OF OTHER THINGS I GUESS. SO HERES THE THING, I WANNA HAVE MORE MUSLIMAH FRIEND BUT MOST OF US OR THEM ARE SO UNAPROACHABLE I MEAN EVEN TO OTHER WOMEN, AND I HAVE TO SAY ITS MOSTLY THE ARAB ONES. ME BEING AN NEW CONVERT AND THERE NOT BEING MANY AFRICAN OR OTHER RACES OF MUSLIMS PREVELENT IN THE AREA I FEEL LIKE IF I WANNA BE SCHOOLED CORRECTLY THEN I SHOULD BUILD A FRIEND SHIP WITH ONE OF THESE SISTA’S…? MOST OF THEM IF THERE BLACK ARE NATION MUSLIMS AND…WELL LETS JUST SAY NOT FOR ME. ANY HOW SHOULD I APPROACH A PREDOMINATELY ARAB MASJID,ALONE BECAUSE MY HUSBAND IS NOT MUSLIM.DOES THAT MATTER? DONT TAKE ME FOR RACIST BECAUSE RACE MATTERS NOT TO ME IT JUST SEEN LIKE IT IS A BARRIER FOR THE MAJORITY BUT WE ARE ALL BROTHERS AND SISTERS IN ISLAM. Your article hit the nail right on the head. I have seen and even heard about some sisters who wear niqab like that. I am a new muslim alhamdulillah. Almost two years now. I think that what you are talking about is very cultural. I know some arab women who even just wear hijab and act like that. They see hijab and niqab as a fashion statement, they dont see its true purpose. LOL THE HO SHOES!!!!!! I knoe EXACLTY what you mean. The 6 inch click click click shoes. Those drive me nuts. Sister, have confidence in yourself. Know that inshAllah you are doing what is right, and pray that these sisters see the error of their ways. Be blessed. aww! i want to be a niqabi! but I dont want to give up my high heeled shoes – they are covered by my abya anyways – look at me justifying! make dua for meeee! i’m going to try wearing it the first day of ramadhan and if I last then khalas – i’m a niqabi insha’allah! What about the ones for children ?